A kitchen utensil designed to fit the top edges of the sink so foods cooked in liquids can be drained easily. The Colander most often will have retractable or folding "arms" that serve as the support arms to extend out and over the sink edges. The Colander basin is then centered over the sink so contents can be poured into the Colander while the liquid safely drains into the sink. 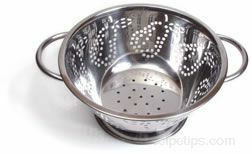 Typically, an Over the Sink Colander will be made of stainless steel for ease of clean up and for safe use.